A note from Charles Fischer: Today we begin a new Saturday article series, “Coaching the Coaches,” to help teach the young coach to learn from veterans. 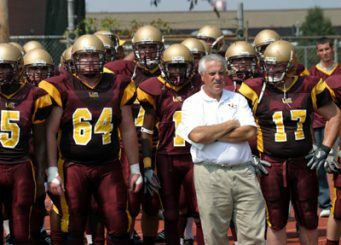 This article is written by a highly successful college coach, who gives us an inside perspective football fans don’t get to see. 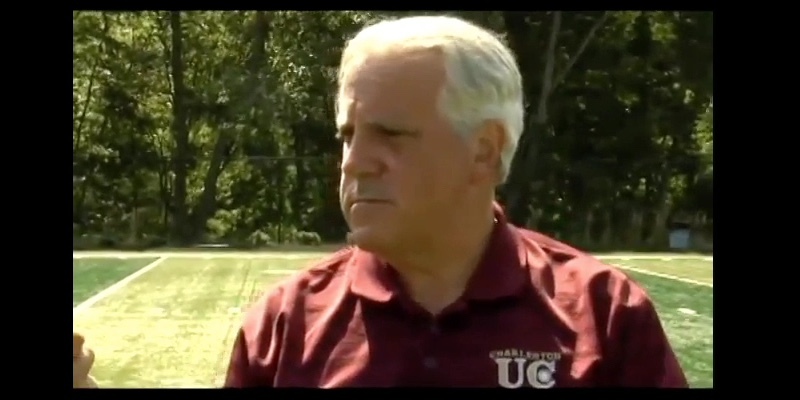 Now let’s learn from the legendary coach Tony DeMeo! After 40 years as a college football coach, (25 as a college head coach) there are some principles that I have picked up along the way that I’d like to share with coaches to help them get a first down or two. Regardless of the offensive scheme you run, there are certain universal truths that – if followed – will produce points. Put speed in space. The more you do, the more points you’ll score. Make cover guys tackle, and tackle guys cover, to create mismatches. Balance is essential – option, power and counter. Drop-back, sprint and play action. It is better to run a lousy play great, than a great play lousy. Get a head start. Use the threat of a counter to keep the defense still, while the offense is moving. Stretch and pierce. A ball carrier going north and south while linebackers are going east and west will always gain yards. Attack complexity with simplicity, and simplicity with complexity. You are only limited by your ability to teach and organize. Details are the difference. Minimize techniques and maximize their use. The fewer the techniques, the more practice time you have to master them. Attack a powerful defense with finesse, and a finesse defense with power. Attack a speedy defense with counters and a slow defense with speed. Prepare for the blitz or it will give you fits. Have multiple answers built into your system. Don’t rely on just “hot reads” or “max protection.” Always protect your protection. Maximize by surprise and disguise – a play that is part of a sequence or a package is far more effective than one that stands alone. Repetition is the greatest teacher if the reps are done with awareness. Repetition is the greatest teacher if the reps are done with awareness. Repetition is the greatest teacher if the reps are done with awareness. Too many answers to a problem equates to no answer and one problem. One great answer is better than 10 mediocre ones. Do what you do. The only tendency that is valid is your tendency to score. Your scheme must magnify the talent of your offense. A good scheme is flexible to adapt to the strength of your personnel, your opponent, the score, field zones and weather without panic. Create a broad-based menu from which to choose your weapon, as long as your basic principles remain consistent. The most important ability is dependability. Never depend on an undependable. 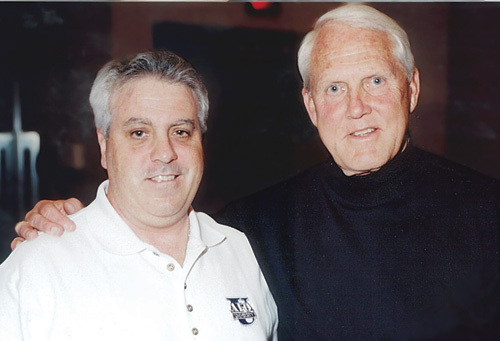 Coach DeMeo with Hall of Fame Coach Bill Walsh. Never fight today’s battles with yesterday’s weapons. Talent is only talent if it fits your system. 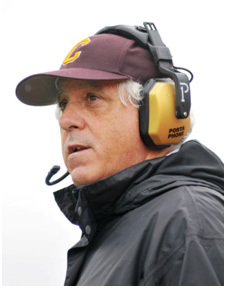 A great play-caller is more concerned with being effective than being clever. “He who controls the pace wins the race” – Jim Valvano. Control the tempo of the game to give your team the best chance to win. Know when to milk the clock and when to go into a hurry up mode. Use the entire field and make the defense defend the entire waterfront. Throw deep and get the ball on the perimeter. When in doubt, go back to fundamentals -there are no “magic bullets.” The plays that work best are the plays that are taught the best. Points after a turnover are a more important stat than just turnovers. You must capitalize on turnovers and red-zone opportunities. Time of possession is only important to an exorcist, it’s an ESPN stat. It is the number of possessions that is important. Limit the plays, maximize the ways. Lining up in a new formation doesn’t require much execution, but a new play calls for a lot of work. Use it or lose it. If you practice it, use it. You’ll only get good at something if you use it in a game. The exception is a specific answer or contingency play. Stick to your knitting – this is something Ralph Isernia, our offensive coordinator reminds me of if I start to stray away from the Triple Gun scheme. Coach DeMeo on the sideline. These 30 universal truths are never outdated. They will always be current and relevant, regardless of the scheme you use. One thing I’ve learned over the years is it’s imperative that, above all, your team must play fast and if they have to think, they sink. Football isn’t chess, there is no pace for deciding. Football is about reaction. It doesn’t matter what you know or what your players know, it’s about how fast they can process information. This listing above is a glimpse, a summary of future articles to come, drilling down into the 30 universal truths. I look forward to contributing more articles to FishDuck.com to help the young coach with the development of his or her career. Repetition is the greatest teacher if the reps are done with awareness.